Mostly forgotten today, Lucius Sargent (1786–1867) showed rebellious tendencies during his student days at Harvard, where he took on the administration over the poor quality of the food that the college was dishing up. He was trained in the law but chose a career in writing and publishing. His favorite topic was social reform, especially temperance and the abolition of slavery. He was known for his caustic writing and strong views and he did not hesitate to excoriate anyone—even as revered a figure as Ralph Waldo Emerson—whose ideas he felt were misconceived or not radical enough. 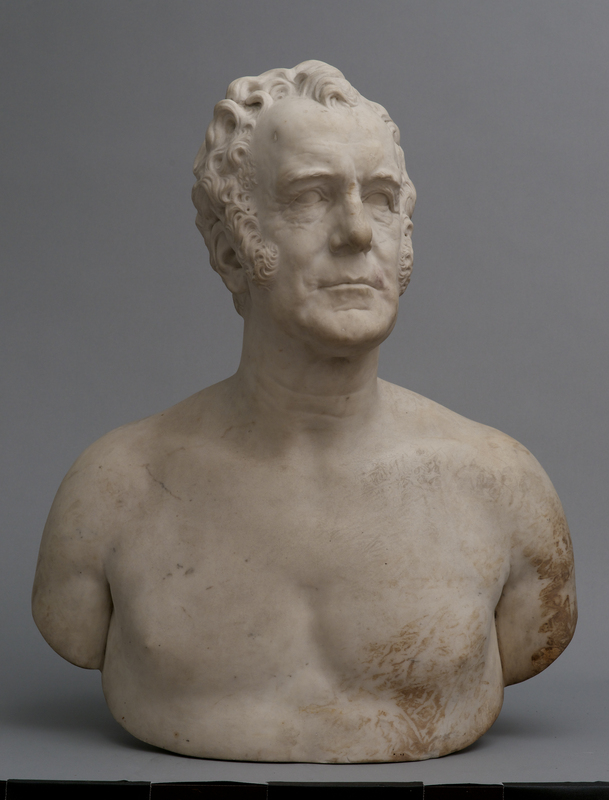 His contemporary fame (and wealth) made it natural that he would have his portrait done, in this case in the form of an especially formidable piece of marble carved by the Anglo-American sculptor and cameo carver Peter Stephenson, who was fresh back from training in Italy. Sargent was no stranger to the arts: his brother Henry Sargent was a successful painter. Inscribed on reverse: STEPHENSON, SC/AD 1853.